Grabien — an online, distributed news prep service — is where newsmakers meet news takers. As the world’s first online marketplace for professionally edited news multimedia, Grabien helps both the supply & demand sides of the news industry. Grabien features audio and video clips from the day’s top stories, drawn from third-party editors. The service primarily hosts short news clips pulled from longer speeches, press conferences, and other news events. Grabien content is generated from a decentralized network of contributors. To ensure the highest editorial standards are met, Grabien staffers only permit content that comports to the site’s rules and style guide. Whenever clips are purchased, the uploader receives a commission, up to 50 percent of that sale. Users receive 500 free coins upon creating an account to get accustomed to the site; these "promo" coins do not credit the uploaders’ accounts. Audio and video clips featured on Grabien are free to listen to and watch. However, video clips include a brief intro as well as watermark and “audiomarks,” which are used to prevent producers from directly recording clips. How Can Grabien Help You? Media. If you work in media, Grabien is a new resource to locate audio and video clips for broadcast on radio, TV, and online news sites. Grabien also partners with established media outlets, providing these organizations with a marketplace to retail their content. Editors/Bloggers/Citizen Journalists. If you produce multimedia — that is, you edit sound/video clips for use online or in professional broadcast — Grabien is the ultimate marketplace to showcase and retail your edited content. If you’re a blogger or small-time media outlet looking to feature multimedia but lack the resources or technical ability to do so, Grabien is an affordable and easy solution. PR & Newsmakers. If you work in PR and would like copies of your clients’ TV/radio interviews, Grabien can help. If the user elects, the clip will be added to Grabien’s MediaBase, where it’s accessible to 3,500-plus users working in media. Meaning, more mileage out of each media hit. News Junkies, Academics, & Researchers. Grabien media includes unmatched metadata — transcripts, locations, featured persons, etc. — which make the site’s MediaBank a powerful research tool. Users can locate media utilizing a host of tools: filters that narrow available media by subject, date, and file type; a key-word search the scans files’ transcripts and other metadata, as well as profile pages where sources, users, and newsmakers list their respective available content. Grabien's technologies are patented (U.S. Pat 9,342,599). Q: Do you have to pay to use this site? A: No. Everything on this site is free to view, hear, and/or read. Members pay the equivalent of between $.05-$.50 for files they would like to keep. There are no membership fees, initiation fees, “convenience fees,” shipping and handling charges, or taxes. Q: How can you charge for this stuff? A: Actually, we’re not. The content on this site is freely available. In fact, with the exception of audio/video recorded off TV, URLs are always provided to the media’s original sources. Users can follow these links to edit clips themselves. However, for a small per-file fee, users can instead pay for others to perform this editing service on their behalf. In effect, Grabien members are hiring third-party a/v experts to record, process, edit, etc., sought-after content that is suitable for broadcast on radio and TV. Of course, these clips are also available for individual news consumers who wish to retain personal copies. Q: Do clips come with licenses? A: No. We do NOT sell licensing; if you need a license, please contact the content creator. Q: Can I request new sound/video clips? A: News tips can be directed here. A formal order form is here. Q: What are Grabien coins and how do they work? A: Grabien coins are the site’s currency. Users spend coins to purchase edited clips. The coins themselves can be purchased with U.S. currency, via credit card, PayPal, and Dwolla. Uploaders receive Grabien coins whenever their content is purchased; these coins can be redeemed for U.S. currency at any point (a minimum of 1,000 coins are required to “cash out”). Uploaders can also put their accumulated coins back into circulation by purchasing other media. Q: Can I receive coins for getting someone else to create a Grabien account? A: If you refer Grabien to a new user, tell that user to enter your referral code during the sign-up process. When that new user creates his account, yours will immediately be given 100 bonus promo coins. Even better: For every deposit this new user makes, your account will be matched 1-to-1 with promo coins. (As an example, if the user you encouraged to sign up buys 1,000 coins, your account will receive 1,000 promo coins.) Note that promo coins work just like regular coins, except with with certain features — such as Requests — the price is slightly higher. Where is your referral code? At the top of your profile page as soon as you log in. Q: How can I find exactly what I’m looking for? — “Keywords in quotes” will search for this exact phrase. — A multiple keyword search without double quotes will search all of these words, but results will not necessarily include these words in the exact order typed. — Using double “less than” signs between keyword terms will only show results that have the keywords in the specified order. (For example, “Hello « world « bye,” would only show results that have these three keywords in this exact order. Q: How is Grabien pronounced? Q: What if I notice a mistake on Grabien? A: If you submit corrections that are determined to be accurate, site staff will supplement your account with bonus Grabien coins. The amount varies depending on the egregiousness of the error. Helping make Grabien the most accurate news source in the world is a profitable enterprise. Q: What's the story behind Grabien? A: Read about the company's history here. Promo Codes. Accounts can only utilize a specific promo code once. Account holders are prohibited from creating multiple accounts to utilize the same promo code twice, or take advantage of other such new-user benefits. Users caught thus attempting circumventing these rules are subject to losing their accounts and being banned from the site. Uploading. Users’ uploaded content must either be non-copyrighted and non-rights reserved, or satisfy Fair Use purposes. the uploading party explicitly represents to Grabien that the uploading party has the legal right to upload the content and that, among other things, utilization, editing, and re-broadcasting of the uploaded content does not violate any law or infringe on the legal rights of any other party. Users must abide by all applicable laws, and Grabien cannot and will not accept responsibility for any other party’s unlawful use of the content. Content cannot be reproduced in whole unless the uploader is also the original source. Everyone else must abide by Fair Use limits to appropriated content. Most specifically, the appropriation must be a very small percentage of the source material (de minimis), or it must pass the test of a “transformative use” to satisfy being perceived as an authorized derivative. The uploading party explicitly represents to Grabien that the uploading party has the legal right to upload the content and that, among other things, utilization, editing, and rebroadcasting of the uploaded content does not violate any law or infringe on the legal rights of any other party. Moderators will to the best of their professional ability reject any media falling outside the domain of Fair Use. Video: AVI, FLV, MOV, MP4, M4V, MPG, WMV, 3GP. Audio: MP3, OGG, M4A, WAV. File Size. The maximum file size is currently 4 GB. Trumping. When two clips of an identical nature are uploaded, preference is given to the first uploader. However, other users can supplant that clip if they can improve upon the file in any of the following ways: better editing quality, higher resolution, video without a watermark, and better original source quality (i.e., the audio is clearer on the clip that trumps the original). As soon as a file is trumped, the new uploader will henceforth be compensated for every download; the original uploader will henceforth receive nothing. Editing. Uploaders may only edit audio/video files in accordance within TV/radio journalistic standards. Clips may — and should — be digitally edited to optimize quality (e.g., audio levels normalized, levels balanced) but not edited to alter content. Uploaders may not edit content to alter the original meaning; attempting to do so will result in being banned from the site after an initial warning. More about Grabien’s editorial policies is available in the Grabien Style Guide. Attribution. Clips must include a source (network/website/etc.) where the content was recorded from. If the idea for the clip came from another news outlet, it's also mandatory to list that news outlet as a source on the clip. Failure to obey will result in the uploader not receiving commissions on said content, amongst other penalties including possible bans from Grabien's marketplace. Prohibitions. Subscription accounts (Gold, Enterprise) are prohibited from being shared amongst more than one media outlet or corporation; sharing login details may result in the termination of the account. Uses & Liability. Any unlawful use of the clips downloaded from Grabien is not sanctioned by Grabien, and Grabien will assume no responsibility whatsoever for any unlawful practices perpetrated by any party downloading clips from Grabien or any unlawful practices perpetrated by any third party in receipt of a clip downloaded from Grabien. By utilizing Grabien or downloading any clip from Grabien, the utilizer or downloader explicitly agrees to hold Grabien harmless in any legal action that might result from that utilizer or downloader’s conduct. We collect information that personally identifies you, such as your name, username, email address, credit card details, and other information as we may from time to time request at our discretion (“Personally Identifiable Information” or “PII”) if you choose to share such information with us. For example, you may be asked to provide us with certain Personally Identifiable Information when you register with or use our Services, sign up for an email subscription, and at other times. The decision to provide this information is optional; however, if you elect not to register with or provide such information, you may not be able to access certain content, features, or services available on or through the Services. We reserve the right to send you certain communications relating to the Grabien service, such as service announcements, administrative messages, special promotions, and Grabien newsletters, which are considered part of your account, without offering you the opportunity to opt out of receiving them. After a transaction, your private information (credit cards, financials, etc.) will not be stored on our servers. We automatically collect Non-Personally Identifiable Information when you use the Site. Non-Personally Identifiable Information includes demographic information (such as age, gender, city or state) and a user’s click stream information. Click stream data is anonymous and can include information such as your IP address, webpages viewed, the date and time at which those pages were viewed and interaction with content and advertisements on those webpages. Technologies used to collect this click stream data include cookies and web beacons. Grabien collects Non-Personally Identifiable Information and stores it in log files. We use this information to help us understand how people use our Site. For example, each time you use the Website we automatically collect the type of web browser you use, your operating system, your ISP, which pages you view, and the time and duration of your visits to the Site. We may supplement our click stream data with Non-Personally Identifiable Information (namely, behavioral and demographic data from third party Services Providers as defined below) to target and serve some of the advertisements you see on the Services. This anonymous supplemental data may include such things as zip code, age, gender, and income range. We use the Non-Personally Identifiable Information described above to better customize the sort of advertisements you see. This information also may be used to help measure and research an advertisement’s effectiveness, or for other purposes. We also aggregate anonymous cookie data in order to identify large audience segments that assist advertisers in targeting their campaigns to the most relevant Internet audience. While we encourage third party advertising providers to comply with applicable law and self-regulatory standards, there are far too many online advertising transactions occurring on our Website to police every transaction. We pass through all advertising disclosures and opt-out mechanisms of the advertising providers, but the use and collection of information by our third-party advertising Service Providers is governed by the individual privacy policies of those providers. We use Personally Identifiable Information and Non-Personally Identifiable Information for internal purposes only, such as to notify you of new products or services, to send service notifications, to customize the advertising and content you see, to offer email promotions from our trusted network of partners (which you may opt-out of at any time, as described more fully below), to fulfill your requests for products and services, to improve the Services, to conduct research, to solicit your feedback and input about the Services, and to provide more relevant and effective products, services, and advertisements on or through the Services. Grabien may share Personally Identifiable Information with its service providers that help Grabien provide the services that you request (“Service Providers”). For example, we may contract with Service Providers to provide certain services, such as credit card processing, advertising, analytics tools, data management services, web hosting, and web development. We provide our Service Providers with the information needed for them to perform these services, however, each Service Provider must agree to implement and maintain reasonable security procedures and practices appropriate to the nature of the information involved in order to protect your information from unauthorized access, destruction, use, modification or disclosure. We may use, and disclose to third parties, certain Non-Personally Identifiable Information regarding the Website (e.g., number of visits, page views, and the like) without your permission. However, such information does not identify you individually. We may use, and disclose to third parties, certain Non-Personally Identifiable Information regarding the Website (e.g., number of visits, page views, and the like) without your permission. However, such information does not identify you individually. As for Personally Identifiable Information, we may share your first name, email address, zip code, and party affiliation with our trusted network of partners. However, we will provide you with an opportunity to opt out of sharing such information. Grabien cooperates with government and law enforcement officials and private parties to enforce and comply with the law. Grabien reserves the right to disclose Personally Identifiable Information and Non-Personally Identifiable Information to government or law enforcement officials or private parties if, in our discretion, we believe it is necessary or appropriate in order to respond to legal requests (including court orders and subpoenas), to protect the safety, property or rights of Grabien or of any third party, to prevent or stop any illegal, unethical, or legally actionable activity, or to comply with the law. IF YOU DO NOT WANT TO RECEIVE EMAIL PROMOTIONS FROM OUR TRUSTED NETWORK OF PARTNERS, YOU MAY UNSUBSCRIBE FROM OUR EMAIL NEWSLETTERS OR PROMOTIONAL EMAILS BY FOLLOWING THE OPT-OUT INSTRUCTIONS CONTAINED IN THE EMAIL OR EMAIL US AT INFO@GRABIEN.COM AND YOU WILL BE REMOVED FROM OUR THIRD-PARTY DISCLOSURE LIST. Once a request to opt out has been received, Grabien will send a confirming email message to the user that the user’s Personally Identifiable Information has been successfully opted out of Grabien’s database. If you do not receive this confirmatory email, then please contact us to ensure that your request was received and processed. IF YOU WOULD LIKE TO OPT-OUT OF INTEREST-BASED ADVERTISING, PLEASE VISIT HTTP://WWW.NETWORKADVERTISING.ORG/CHOICES OR HTTP://WWW.ABOUTADS.INFO. PLEASE NOTE that if you erase or otherwise alter your browser’s cookie file (including upgrading certain browsers) you may need to opt out again. We also sometimes use, or partner with publishers, publisher-facing, or app developer platforms that use mobile Software Development Kits (“SDKs”), or use an SDK with a mobile app that we offer, to collect Information, such as mobile identifiers (e.g., IDFAs and Android Advertising IDs), and information connected to how mobile devices interact with our Services and those using our Services. A mobile SDK is the mobile app version of a web beacon (see “Web Beacons” above). The SDK is a bit of computer code that app developers can include in their apps to enable ads to be shown, data to be collected, and related services or analytics to be performed. We may use this technology to deliver or help our Partners deliver certain advertising through mobile applications and browsers based on information associated with your mobile device. Depending on your device, you may be able to reset your mobile device's advertising identifier at any time by accessing the privacy settings on your mobile device. In addition, each operating system, iOS for Apple phones, Android for Android devices and Windows for Microsoft devices, provides its own instructions on how to prevent the delivery of tailored in-application advertisements. You may review the support materials and/or the privacy settings for the respective operating systems in order to opt-out of tailored in-application advertisements. IF YOU WOULD LIKE TO OPT-OUT OF SUCH AD NETWORKS’ AND SERVICES' ADVERTISING PRACTICES ON THE PARTICULAR DEVICE ON WHICH YOU ARE ACCESSING THIS POLICY, GO TO HTTP://WWW.NETWORKADVERTISING.ORG/MOBILE-CHOICE TO OPT-OUT FOR YOUR MOBILE WEB BROWSERS. YOU MAY ALSO DOWNLOAD THE APPCHOICES APP AT //WWW.ABOUTADS.INFO/APPCHOICES TO OPT-OUT IN MOBILE APPS. PLEASE NOTE that all Cookie and Mobile opt-out tools referenced above are provided by third parties, not Grabien. Grabien does not control or operate these tools or the choices that advertisers and others provide through these tools. Please be advised that, whenever you voluntarily post information to any Grabien community page or any other public forums, such information can and may be accessed by the public. This means that any person or entity with access to such information can potentially use it for any purpose, including sending unsolicited communications. We recognize the importance of safeguarding the confidentiality of your information. Accordingly, we employ standard security measures designed to protect your information from unauthorized access. However, no data transmission over the Internet or other network can be guaranteed to be 100% secure. Therefore, while we strive to protect any information you transmit on or through the Site, please be advised that Grabien assumes no responsibility or liability for disclosure of your information due to errors in transmission, unauthorized third-party access, or other causes beyond Grabien’s reasonable control. We process and store all information in the United States. By using our Services, you agree that the collection, use, transfer, and disclosure of your Personally Identifiable Information will be governed by the applicable laws in the United States. The Grabien Services are directed to, and intended for use by, adults only. We do not knowingly collect information from children under the age of 13. If we become aware that we have inadvertently received information from a child under the age of 13, we will delete such information from our records. Because we do not knowingly collect any information from children under the age of 13, we also do not knowingly distribute such information to third parties. California’s Shine the Light law provides California residents with the right to receive disclosures about any sharing of their personal information with other companies. If you are a California resident and you provided your personal information to Grabien, then, once each calendar year, you may submit a written request for information about the information we shared, if any, with other companies for their use in direct marketing. To submit your written request, please email us at info@grabien.com or send us a letter at Grabien Inc., Attention: Privacy, 257 Grand Street #1113, Brooklyn, NY 11211 with “Request for California Privacy” in the letter subject line. We reserve our right not to respond to requests sent more than once in a calendar year, or requests submitted to an address other than the one posted in this notice. Please note that the California Shine the Light law does not cover all information sharing. Our disclosure only includes information covered by the law. If you are a resident of the EEA or Switzerland, the following information applies with respect to personal data collected through your use of our Services. Personal data we collect may be transferred to, and stored and processed in, the United States or any other country in which we or our affiliates or processors maintain facilities. We will ensure that transfers of personal data to a third country or an international organization are subject to appropriate safeguards. If you are a resident of the EEA or Switzerland, we respect your rights according to Chapter 3 of the EU General Data Protection Regulation. In order to verify your identity, we may require you to provide us with personal information prior to accessing any records containing information about you. Grabien adheres for the most part to the AP style guide. This guide will expand as new style issues arise. Affiliates. When creating a new source for a local network affiliate, write the call letters first and then in parentheses, the station and city. For example, news clips that come from Fox’s St. Louis affiliate, KTVI, would have “KTVI (Fox 2 St. Louis)” listed as the source. al Qaeda. Not al-Qaeda or Al Qaeda. Crosstalk. If content features crosstalk — where multiple people are speaking at once, rendering the words difficult to decipher — the transcript should indicate as such in brackets (e.g., “[crosstalk]”). Em dashes: When using em dashes — where information is parenthetically contained within a sentence, as is being done here — use a space on either side of the em dash. Em dashes are double the length of usual dashes; if you do not know how to create one with your keyboard, double dashes are sufficient -- such as that. Ellipses. When ellipses are used in text, put a space on either side — Like … this. E-mail. Not email. Use a hyphen (e-mail if it’s not at the start of sentence). Gaps. Audio clips may be edited for length so long as the meaning of the content is not altered. Gaps between a speaker’s sentences can be shortened according to customary practice (i.e., not so much so that the clips sound edited). If words are excised to edit a clip for length, the original meaning of the clip must remain the same, and the clip’s transcript must indicate the excision with ellipses. Video clips may also be edited for length. Again, the original meaning of the clip cannot be lost or altered in the process. Excisions must be marked by obvious visual elements signifying a passage of time. Health care. Not healthcare or health-care, unless the latter is modifying a noun (as in, “health-care spending”). Honorifics. Users who upload media featuring people not yet in Grabien’s MediaBank will be prompted to provide more information on these new entries. The name on the profile should include only the individual’s name — without any honorifics. For instance, because President Barack Obama has served in multiple offices and content may appear from any of these time periods, all content related to Barack Obama is listed under “Barack Obama” — not Sen. Obama or President Obama. Within individuals’ biographies, AP style prevails: Honorifics are to be used on the first mention; Mr., Mrs., and Ms. on future references. The “Dr.” honorific should be used only with individuals who hold a doctor of dental surgery, doctor of medicine, doctor of osteopathy, or doctor of podiatric medicine. Internet. The Internet is a proper noun and is therefore capitalized. ISIS. The terrorist group alternatively known as ISIS (The Islamic State of Iraq and Syria) and ISIL (The Islamic State of Iraq in the Levant) should simply be referred to as ISIS. ObamaCare. Not Obamacare or Obama-Care. PATRIOT Act. Not Patriot Act. Quotes. Punctuation goes within double quotations, not outside. For example “Like this,” not “like this”. Roadmap. One word. Not "road map." District of Columbia — D.C. Tea Party. For clarity, refer to the political movement as Tea Party and the social gathering as a tea party. Theater. Not “theatre.” Grabien uses the American spelling whenever there’s a divergence between British and American English. Transcripts. Transcripts should feature a person’s name in all-caps, followed by his/her quotation. As indicated above, crosstalk should be noted within brackets, and any edited-out language must be noted with ellipses. In the event you don’t know a featured person’s name, use his title/position instead. In the event you’re uploading a clip featuring one person speaking in extended length, paragraphs are encouraged. Please see this page as an example. U.N. When abbreviating the United Nations, use periods (not UN). U.S. When abbreviating the United States, use periods (not US). If you’re curious how Grabien came to be, my name is Tom Elliott, and I’m the company’s founder. To understand the company is to understand its provenance. the news never stops, and the process of recording content, loading audio files into an editing program, pulling out clips, transcribing clips, labeling clips, writing clips up for daily cut lists — all takes tons of time. And that's just one aspect of producing a daily three-hour radio show. I thought about producers I knew at shows that aired earlier than ours. Wouldn’t it be easier if we could pool our efforts so not every program had to create their own versions of the same clips? If you look at the industry from a bird's eye view, redundancy was everywhere. Grabien, as originally conceived, would serve as a database of news clips that producers could both post to and pull from. Without having to handle this kind of nitty-gritty work, producers would finally have time for more creative, higher skilled work. The problem? Producers, facing the aforementioned daily time deficit, couldn't be counted on to populate such a database. What I ended up doing instead was hiring a staff to clip the news ... for the industry at large. 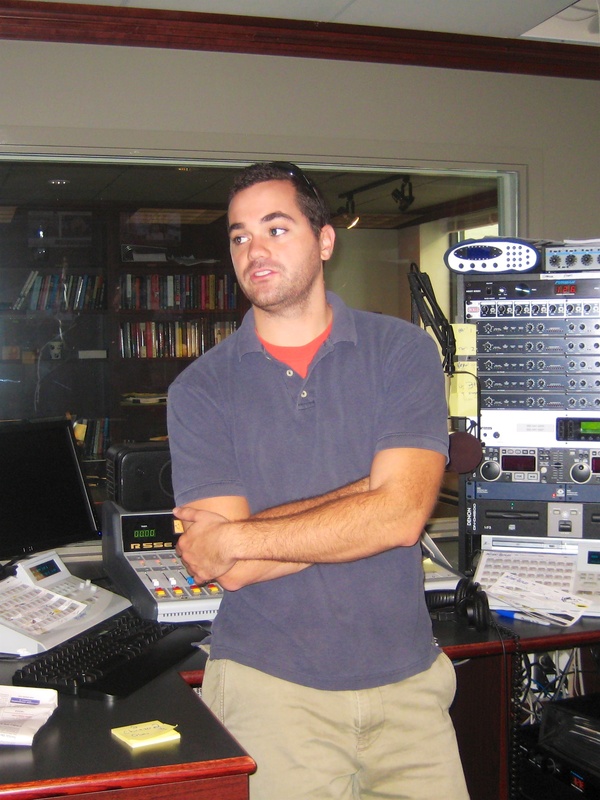 For radio shows, Grabien became a way to subcontract out production. Early on I realized the online news world is similarly inefficient. Virtually every major news site employs a "video guy" to create the clips that are embedded atop articles. In a media landscape struggling with profitability, that kind of duplicative work seems wasteful. So Grabien quickly evolved from being audio-focused to video-focused (while creating tools that enabled radio producers to easily pull sound from video clips). Today Grabien works with almost every major show in talk radio as well as most of the big online news sites. Blue chip PR firms and popular media personalities utilize our monitoring service, and we've recently launched a news site specifically for consumers. Along the way we've invented a number of innovative production tools (our LiveClipper lets producers tune into a live news event and create clips on the fly, simply by highlighting a portion of the transcript they'd like a clip of; our NewsMonitor lets producers tune into every major news event — simultaneously; our LiveShare lets organizers not only stream an event, but their fans to create clips and share them with friends/fellow fans/etc., helping organizers get more bang for their buck). We’ve partnered with iHeartRadio/Premiere, which, alongside Krantz Media Group (KMG) represent Grabien in barter contracts with radio stations. We’ve partnered with the two of the biggest content providers in the world for news and stock photography; they use Grabien’s platform as another monetization opportunity, and our clients enjoy discounted access to their databases. And we’ve recently launched this slick new website. What comes next? Check out our Manifesto for more on that. Imagine an online marketplace where news from around the world is available for searching, previewing, and purchasing. Pre-edited news clips, print reporting, photojournalism, polling data, studies — everything. All available in one easily navigable website, with metadata that makes searching and subscribing to favored topics and users completely simple. A place where traditional media compete alongside citizen journalists; a reimagined news ecosystem where anyone with a smartphone can wind-up serving as a stringer for a news wire; an online store publishers use to quickly locate the perfect news clip needed for a post. Today, a lot of disintegration remains within the news industry. News happens; someone captures it; a reporter covers it; an editor proofs it; a news outlet publishes it; the content is distributed in print, online, and via digital channels like Apples News/Facebook Instant Articles, etc. ; consumers read it, some share it, some comment; others come across this news from those who’ve shared it (either directly or over social media). Every step in this process occurs within its own silo. But this whole process could occur within one platform. This would make the process more efficient, the industry more profitable, and news more accessible (and, with fewer middlemen, more accurate). We're imagining an entirely new media ecosystem, from collection to consumption. We believe value can be added, from professionals and amateurs alike, at every stage of the distribution chain — even from end-use consumers. If that value is compensated, the system becomes more dynamic, responsive, and, if strategically executed, the overdue overhaul that enables the news business to stop cannibalizing itself. The news industry can thrive in an era driven by technology. And we plan to build that future. If you share our view of what the future of news will — or, can — look like, and want to help us build it, we're always looking to explore new partnerships. Contact us. Mr. Kerchoff comes to Grabien with more than 15 years of IT and management experience. Having risen from engineering and R&D, to executive level management at many high-tech companies, including a few media start-up companies, Andy is a senior network professional with many years of broadcast video and streaming media expertise. Andy has joined the Grabien team to help expand the Grabien marketplace and streamline the backend systems that run the Grabien website. Joseph is a graduate of industrial engineering in Ateneo de Davao University in Davao City, Philippines. He has been in the outsourcing industry for almost 10 years. He is also a part-time real estate broker and blogs about the local music scene and events in the city.